If this video isn't a reason to share sleep (cosleep), I don't know what is. Her pleading cries, that just beg to have someone close to her through the night hours, are heart breaking. The way she clings to her daddy for comfort in her exhausted, anxious state is clearly an example of needing to be close to her parents. This clip was originally titled, Father Goes into Baby Crib. The father in this clip writes, "This is a video of my daughter Michela who for several months just can't get to sleep without waking up every 2 hours. I had enough and decided to help her sleep, but would not recommend this to anyone as it kind of backfired on me." Since this father posted his video of a tired, sobbing Michela in need of comfort, the video has been re-uploaded by people all over the web calling it "hilarious" and "funny" "so cute" and "one of the sweetest things I've ever seen!" Are people this uninformed about normal infant sleep and babies' night time needs? Are there really those out there who are not shaken (to their core, really) by the desperate cries of a baby? One YouTube user titled the repost, Daddy and his crying baby - HILARIOUS Another titled it, Baby wants to sleep on her father LOL!! The video was even translated into Spanish in the uploads, Padre Desesperado and in two locations titled, Papa Desesperado. I am curious if anyone has ever shared The No-Cry Sleep Solution with this family? Surely it would help to eliminate some of the tears, and some of the fears that this baby girl is dealing with. I wonder if her parents ever read Dr. Sears' The Baby Sleep Book or Nighttime Parenting to grasp their daughter's sleep patterns, and all the reasons that it is typical for even older babies to wake through the night when they are left solo in a room. She looks ready, willing and able to sleep - she just needs someone close. And who doesn't? What dependent little babe wants to sleep alone at this tender, vulnerable age? I'd love to provide this tired father, and his exhausted little girl, with of a copy of Why Love Matters, or The Science of Parenting, for some neurological insight into the huge impact that these early night time parenting choices have on her development and attachment capabilities, both now and in the future. 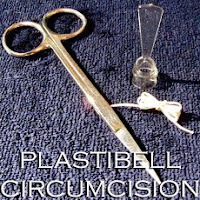 many resources have been collected on this page. Video and photos from others who have done just that here. That video just breaks my heart... I think it was intended to be comical.. but it was far from that to me. That poor baby just needed some contact with mommy and daddy. Every night as I sleep with one of my girls on each side of me... I know that THIS is how God intended for us to sleep. AS A FAMILY! thanks for sharing. Pantley's "No Cry Sleep Solution" saved my life! I hate cry it out! I tried to imagine myself in her shoes: obviously upset, with the hope that someone is going to soothe me when arms reach out.. only for that person to lay me face down in what doesn't look like a very cozy environment... nothing to snuggle with...even more frustrated and disappointed that my needs weren't met and the cues I gave unanswered...How can a parent be so detached?!? I kept thinking, just stick her in bed with you! she'd probably sleep straight through! 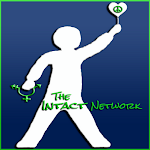 I L♡VE what Pinky McKay wrote, "I HATE baby training and the undermining of parents confidence that it results in. Babies aren't puppies! Attachment is a 24 hour process that doesn't shut down when baby sleeps. Listen to your child, listen to your heart. Trust this connection." YES!!! love this!!! I keep telling dh to stop making that comparison. even puppies need love and cuddling all the time! tear them from their mother usually too early and then lock them in a crate/other room while they cry when u bring them home at night. they're social baby animals too. Oh, what a little sweetheart! Silly parents! i cannot believe that! bring the poor girl to bed! Geez!! Pick that child up!!! Well he is joining her in prison! That's how I feel about cribs n playpens. At least he is comforting her though. 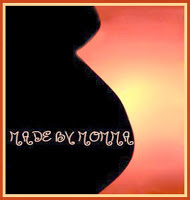 Holly ~ It is one of the books I wish I could buy for ALL parents to be. Danielle ~ that is exactly how I felt when watching this. I actually had to shut it off the first time, take a deep breath and keep watching. I know he was making this video out to be a joke. But there is NO JOKE about the painful night time suffering of a baby who needs to be close to her mom/dad. It is honestly heartbreaking to me. And the initial way he tosses her back down in the crib and starts to walk away... I wonder how many times this was done? 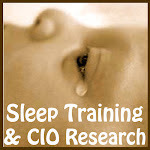 CIO/sleep training/etc. are just downright scary methods that no other mammal would resort to -- what creature besides a human would IGNORE the cries of their infant?! It is insanity. And just so I don't get hate mail (ha!) I am not advocating for BEDSHARING for everyone - but sleep sharing (cosleeping near your baby). This IS beneficial for every baby with the exception of one whose parents smoke. The comments on this video on YouTube are sick - Laughing about this. All I see is a baby desperate for closeness. What nonsense! This is nothing more than a stunt by a publicity seeking moron. The kind of idiotic video you would see on the TV show for the mindless called america's funniest home videos. They just happened to be filming all this, right? I hope his daughter turns out to be more intelligent than he is! it is sad that this exhausted little girl was USED for the making of this video. it is not funny at all. it is heartbreaking. Ugh, I hit play and kept reading another article. Well DH heard the crying and started freaking out. He thought a poor kid was being tortured. (Of course, she is, but you know what I mean). This just makes me want to go pick up my one year old from her happy playing and hug her for an hour! So glad we will get to snuggle all night tonight, and that she's never been left to cry for her mama. I wish my daughter went to sleep that easy!! All he did was lie down, and she immediately went to sleep! We have an hour long nursing, rocking and cuddling session before my daughter goes to sleep, and we STILL don't cry it out! I actually can't watch this video, the first 10 seconds is making me upset and I feel like crying. How people can let their children CIO is beyond me, it just goes against nature. This poor little child, I just want to pick her up and hold her. 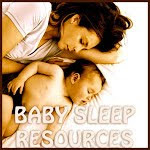 There are certainly great parents with securely attached little ones who choose not to sleep share/cosleep (i.e. sleep with baby nearby) or bedshare (sleep on the same surface). Responding to a baby's needs (NOT letting them CIO or practicing 'controlled crying' or 'sleep training') can certainly be done without sharing sleep. 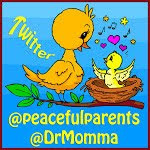 It is just much easier on mom (especially) if baby is nearby to attend to during nighttime feedings/need for comfort/etc. And the physiological benefits (and protection from SIDS) still exist during the first 12 months of life whether we choose to capitalize on them or not. All mammals were made to sleep close to their mother for their first weeks/months/years on this earth for the safety/developmental factors involved. I'm afraid that a lot of people assume that cosleeping and bedsharing are the same thing - they are not. There are many instances in today's modern Western world where bedsharing is not safe for baby (i.e. parents have a waterbed, not enough room, are not breastfeeding, do not WANT to bedshare, do not wish to move mattresses to floor, etc). But cosleeping/sleep sharing is still a possibility (and beneficial one) by moving the crib next to parent's bed and dropping one side (see this video for an example: http://www.drmomma.org/2010/01/turn-your-crib-into-cosleeper.html), or using a side-sleeper or side-car, or simply moving mattresses together with one being safe for baby. While no parent is 'good' or 'bad' because of their sleep choices - we are all learning, growing, and trying to do what is best for our little ones - it is difficult to deny the realities of all the research (and anthropological mammalian experience) on sleep sharing vs. solo sleep for infants. 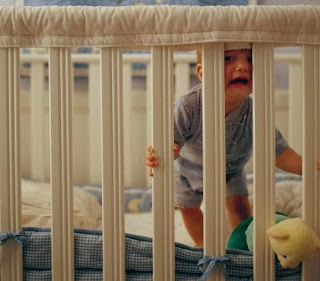 I would hate to see another baby die from SIDS just because his mother thought she HAD to 'sleep train' him in a room apart from the safety of her own body - baby's natural habitat that regulates his respiratory, cardio, hormones, etc. I'd encourage anyone thinking about this subject to dive in further before making up their mind on the matter. The crying of my little girl even silenced up my 5 month old. He was sitting next to me on the couch playing and when I played the video he stopped and just stared at the screen. If even a baby can understand when another child is in distress, then an adult clearly should! This is incredibly heart breaking. Just watching her cling to her dad as soon as he gets in the crib is just too much. I feel sorry for that poor baby. My boy still wakes up every 2-3 hours every night and has done so since day 1. Do I miss sleep? Yeah. But am I going to force him to adhere to my schedule or let him cry because I don't want to deal with it? NO! I chose to have this child knowing full well that I have to change my life for him, not the other way around. 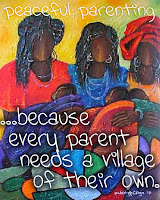 It's such a short time when a child is fully dependent on his parents. And I plan to nurture that dependency so that in a few years, my boy will grow to be independent because he trusts me. My husband actually does that! It's not that our baby isn't allowed in our bed, but we have a small apartment and sometimes it's necessary she not be in our bedroom (my computer is in there and I work from it often) so when she's upset like this baby was, he will go in the crib with her. it's really sweet though! I also can't stand to have a baby cry :( We have friends who did CIO from day ONE with their baby. It was so fun (not) to visit to meet the baby and be told that the crying we heard was her having to learn to get over whatever she needed. I had a hard time not running to get that baby! I get the impression that this little girl has been used to bedsharing, or at least to being cared for when she wakes. I thought it was sweet that she had such a bond with her father that she was able to calm down so quickly (my son's dad couldn't possibly have done that with him). From the father's comments it seems this was just a short experiment in sleep training, which obviously failed. I also know how it is sometimes when DS falls asleep nursing and I want to stay up. I thought it was funny seeing this dad try to do what I do without being able to roll over and back up. And when he finally did try rolling over anyway, she climbed right back up on him. I've been there. WOW. Poor baby! She just wanted someone to hold her. Thank goodness he decided to! That brought tears to my eyes. My 8 yr old freaked out when I clicked play on that, came running over demanding to know what I was watching. she was never ever left to cry and still shares sleep with one of us if she needs to so was very alien to her! My 14 month old WILL NOT sleep with me. She hasn't sense she was about 6 weeks old. She would not sleep ulness I put her down. She does not like me to rock her or be in her room with her. I've tried putting her in bed with me cause I wanted to snuggle and she will not go to sleep EVER. I love holding her and sleeping with my kids but she doesn't. Never has. She very rarely cries when she goes to bed. Many times she takes her blankey and goes up to her room herself while I follow behind. My 3rd child loves to sleep with us and so does my 1st (my 14 month old is number 4). Every baby is different. I tried to watch but could not watch more than a few seconds with my 2 year old in the room for fear it would be too distressing for her to hear. My friend who has a four month old, went to her midwife to ask for help getting her baby to sleep as she is so tired and he has been up alot in he night. The midwife told her she could just ignore him between the hours of 8pm-7am and he would then start to learn that there is no point crying as nobody will come! I nearly cried myself. Aww, what a little cutie, I wouldn't have given up either! I remember even being five or six and just needing to cuddle with my mom and dad. When we brought our first one home from the hospital, we put him in an crib right away, and I thought right on, no worries, little did I know all of the negative things that would come with it. He was fine in the crib, but mommy ended up with post partum depression, he can't sleep through any noise at all anymore, and now he's three and wakes up to come into our bed at one in the morning (his daddy is still stubborn and doesn't want to co-sleep), which I love. Now we are getting ready to have another baby and man have my views changed, co-sleeping , elimination communication, and many other wonderful things about raising babies have been brought to my attention, so grateful for that! I wish I wouldn't have had to learn from the school of hard knocks with our first one! my almost 2 year old son still sleeps in bed with me. tho his daddy doesnt like it i dont mind it one bit. my son can roll over and get boobie when ever he wants it and then he cuddles with me all night. i wouldnt change it for anything!! only get one chance at this and its only for a short time in life that my son will want to be so close to his mommy! !